The basic global social struggle, the basic cultural context of resistance to and ravaging by imperialism, the basic tribal society in which the pattern of global Euroimperialism was set is that of the Celts. Everything that was done over the centuries to the “third world” by the European colonialists was first practiced against the Celtic peoples of Europe. The African slave trade, the genocide of Native Americans and the colonialist parasitism of India all had their precedents in Celtic Europe. Celtic society was the first traditional, tribal, indigenous, non-imperialist obstacle to imperialism. Celtic culture was the primary alternative to imperialist culture. Celtic indigenous ties to the land were the first extensive impediment to the spread of imperialism. 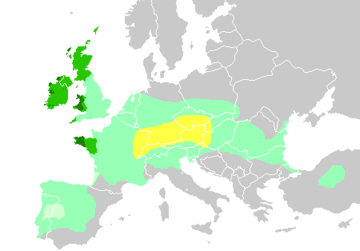 The continuity between Celtic Europe and the third world of later centuries is clear in the language of the Greeks and Romans, who, sounding very much like the English speaking of the Irish, Scottish Highlanders or Welsh, described the Celtic peoples of Europe as primitive, savage, barbarian, bestial and insane. This also sounds remarkably like the European propaganda regarding Africans, Indians, Australians, etc. As with the third world, the history we are given regarding the Celts is filtered by the interests of those in power, the imperialist forces bent on destroying them, from the second century BC in Gaul and Iberia to the nineteenth century AD in Ireland and Highland Scotland. The nature of the societies destroyed, and the atrocities committed against them in the process, and the motivation behind this millenia-old struggle are all hidden from the view of the public and the academic. 1. The chronic struggle between imperialist powers and the people who live on the land, in villages, with local cultures and agrarian lifestyles. This dynamic can be seen in Europe and also earlier, in Mesopotamia and Anatolia. 2. The constantly expanding nature of imperialism (capitalism). A defeated Empire has its ruling class and aspects of its social structure altered by conquest, but its expansionist nature is rarely altered except by social collapse. 3. The indigenous, traditional and tribal nature of Celtic society. Celtic Europe must be seen as being of a kind with the other indigenous cultures of the world oppressed by imperialism. Celtic Europe is not to be lumped together with Greece and Rome or with the Germanic and Slavic powers which supplanted it and were largely derived from it (Rome especially). 4. The continuity of peoples and of the ruler-rural dynamic, and hence of the atrocities against colonized peoples, in the Celts and other world peoples, for centuries and millenia. There is not a dysjunction of history in 1492 when European imperialism was carried to other continents. The expansion of Spain and later other European powers outside of Europe was part of a process which had begun two millenia earlier. In many historical conflicts we see this same theme played out. The French Revolution, for example, was couched in terms of class struggle and of French nationalism; Celts were not mentioned. Yet the French peasant fighting for liberté was mostly the descendant of Gaulish tribesmen subdued by Rome, and he was fighting against a ruler of different ethnicity, an aristocracy largely of Frankish blood, who had replaced the Romans, if we cannot say evolved from them. This is not the way we are taught to see history. We are taught that it was the French against the Germans, England against Spain. The story of the extensive and ongoing reorganization of society, of the constant expansion of the imperialist system and extension of its control further into the rural areas, into the social structure and culture of rural, Celtic-based Europe. History books do not even acknowledge the existence of this Celtic reality. Repeating the Græco-Roman propaganda, Europe is seen as uncivilized until the development of Greece and Rome. Greece is claimed as the cradle of Western civilization and culture. The image conveyed of ancient Europe is Roman. The Roman Empire is not described as the root of the feudal and then global imperialist systems which evolved in Europe, it is described as the root of European society and culture. The Celtic root of much of Europe’s rural culture is ignored. This is an utterly false perspective. Celtic Europe was for its time highly democratic. Women had considerable power. There were women warriors. Every member of the society had dignity and rights. Yet we are taught that the cradle of democracy in Europe is Greece, in a society whose economy was entirely based on slave labor, and whose social organization evolved to constantly expand, incorporating “allies” as colonies and progressively parasitizing and castrating them culturally. Our history books tell us about Socrates, Euripides and Pericles, but little mention is made of the Athenian Empire.